This is the softest little quilt made of flannel. The best part about it is how dang easy it is to make! You can have it done in just a couple hours. Make a fabric sandwich like the picture above and below! Now sew a seam down the middle of each fabric sandwich to hold all three pieces together. Once you have sewn a seam down each fabric sandwich strip lay out your quilt. Snip fabric with scissors along each sewn line. Wash it... this will make it more raggy and get rid of all the little strings!! Fun! 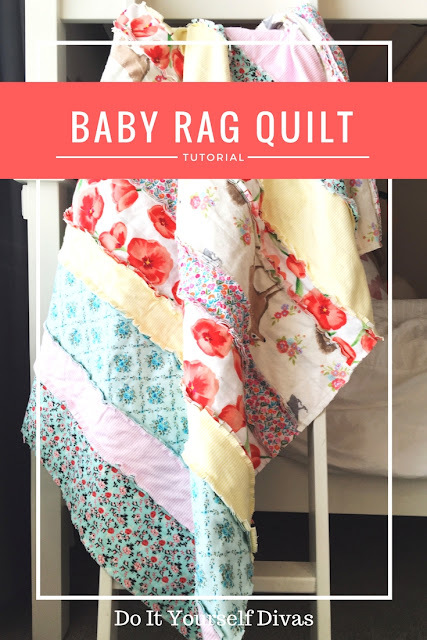 It looks great, such cute fabric and I love the rag quilt look! 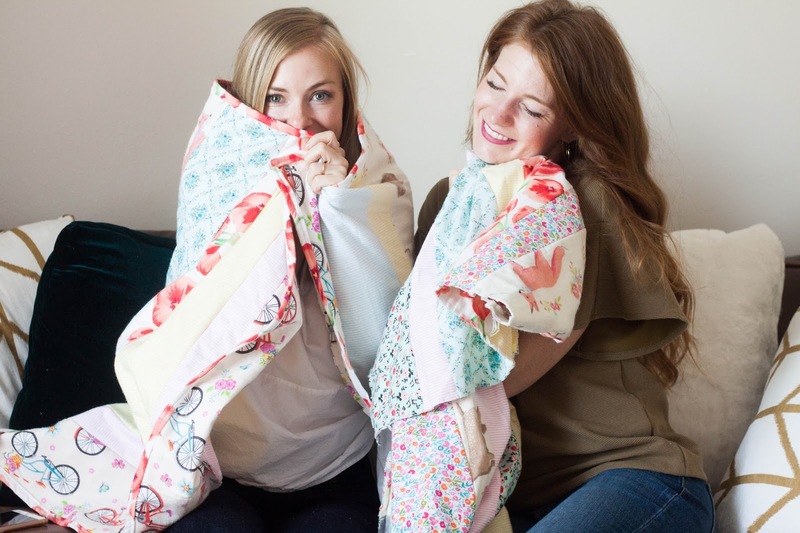 I love this quilt and actually used your instructions to make quilts for my siblings for Christmas. They all fell in love too! wow. it looks very worthful. love it! your directions say to cut 7 different fabrics but the picture only shows 6 and did you put to 6" strips together in the middle? The 7th fabric is for the binding. Sew in 5/8" seams. What is the finished size of your baby quilts? I'm working on making one of these, but I'm confused about your dimensions of 48x42. If each side has 7 different fabrics cut at 6 inches, and 7 different fabrics cut at 3 inches, wouldn't that make the quilt much larger? I've just finished the cutting stage, but as I'm laying them all out it looks quite big. Thanks for your help! Once the quilt is sewn together and bound it will be much smaller. Happy sewing! Madre - I had the same question, but at first I only counted 5 different fabrics. I had to go back and count again after reading your post. Funny, because then I counted 7 in the photo at the very bottom of the page. There looks to be a blue polka dot fabric next to the blue paisley. This is so darn cute! I am so in love with this idea, I can't wait for the stores to open so I can fabric shop! Thanks for the inspiration! Hi! Thank you for this easy to follow page. Do I wash the fabrics before I sew them together? Hi there. You are welcome. Wash your fabric after for best results! Thank you again. Can't wait to start sewing! Thank you for all the help. I just finished my first blanket. I'm trying to picture 48 x 42" would this be large enough for an elderly adult? Would we just add more strips repeating the pattern if we wanted it larger? Hi your strips look very angled and not straight striped, did you just freehand that? I like the uneven look and want to duplicate it. Also would you just add more strips to add to the finished size? I'd like to make this for my elderly mother. Can you please tell me where you got your fabric....I LOVE the patterns....Or if you know the brand....thank you....It's beautiful! !